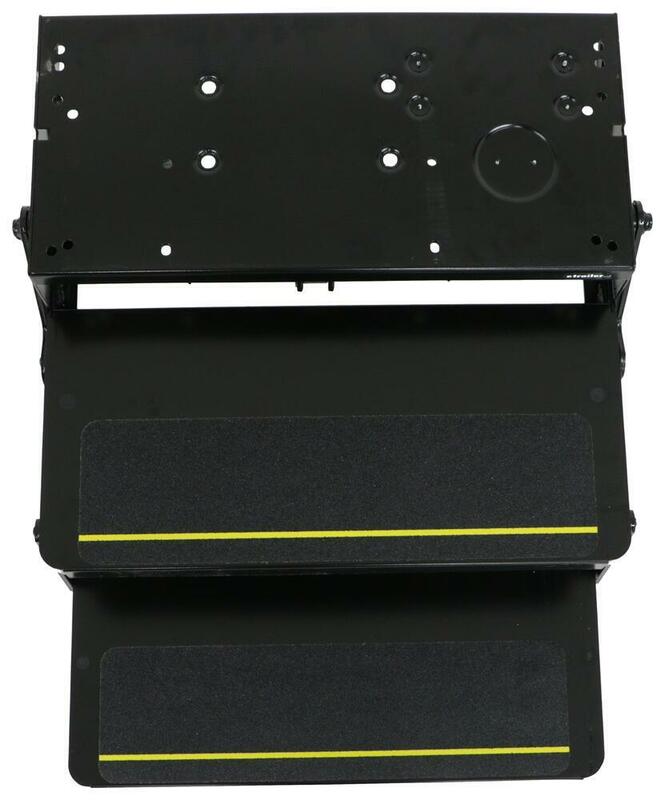 This 10-3/4" deep motorized step automatically extends and retracts when you open and close your RV door. Non-skid stepping surface ensures solid footing. Includes motor. Lowest Prices for the best rv and camper steps from Lippert Components. 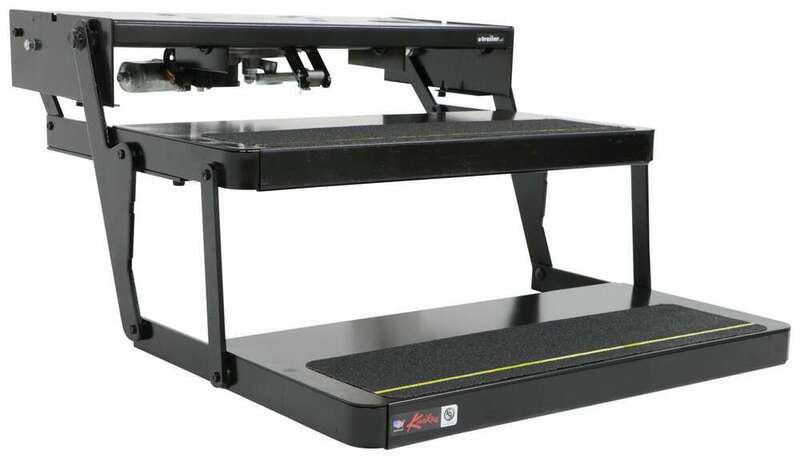 Lippert Kwikee 32 Series Electric Step - 2 Steps - 7" Drop/Rise - 24" Wide - 300 lbs part number LC3722616 can be ordered online at etrailer.com or call 800-298-8924 for expert service. 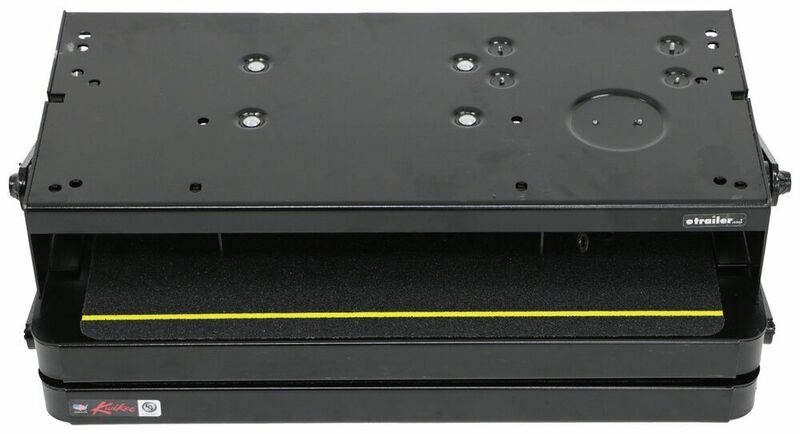 This 10-3/4" deep motorized step automatically extends and retracts when you open and close your RV door. Non-skid stepping surface ensures solid footing. Includes motor. These motorized RV steps make getting into and out of your RV simply effortless. They automatically extend when you open your RV door and retract when you close it - unlike manual steps that must be pulled out and pushed back in. The included door switch has 2 pieces. One piece mounts on the door frame and the other piece mounts on the door itself. When you open the door, the switch is activated, causing the steps to extend. When you close the door, the switch signals the steps to retract. Because these steps wire to a power switch inside your coach during installation, you can override the automatic operation by simply turning that switch off. When you turn the power switch off, the steps will remain extended or retracted. This is convenient when your motor home is parked and you want your steps extended at all times so that you can easily get back into your RV. As a safety precaution, the steps will retract when you turn on the ignition, even when you override the automatic operation, just in case you forget to retract them before driving away. If an obstruction is detected while the steps are attempting to extend, the steps will stop extending and reverse back into the retracted position. This feature helps to prevent damage to the steps and to your RV, and it can help prevent injury to passengers. For added safety, the steps are covered with a non-skid, textured coating. This textured surface provides traction and ensures that you have secure footing even when the steps are wet. 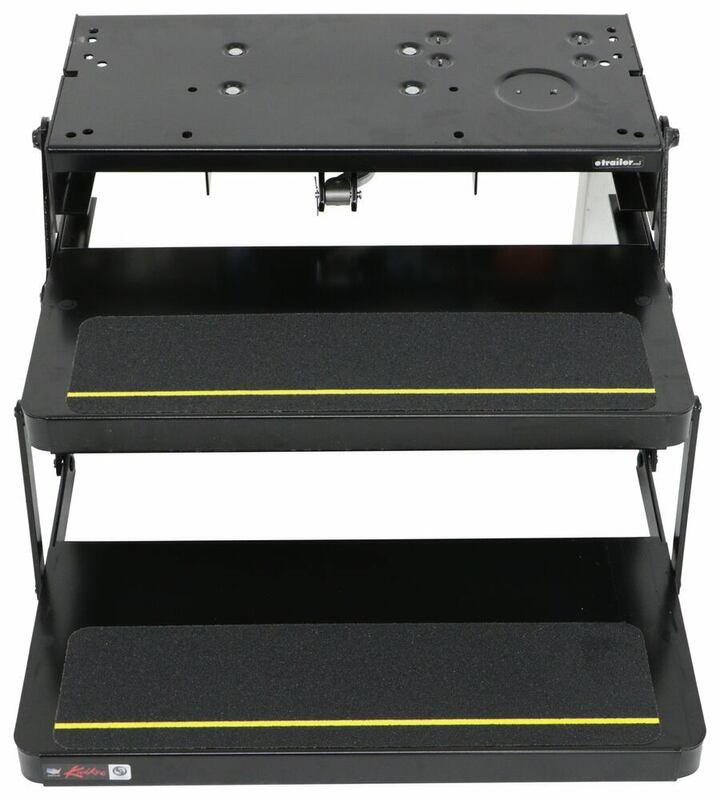 Kwikee motorized steps are made of powder coated steel to ensure many years of dependable use. And the solid steel drive rods offers the strength and durability that you demand from an RV step. The black powder coat finish provides a sleek look plus added protection against the elements. Installing the steps on your RV is simple. Pre-drilled holes in the steps' mounting bracket match up to holes in your RV's frame for an easy bolt-on installation. You will need Lippert's mounting hardware kit (LC118155-72 - sold separately) to bolt the steps into place. Use 2 carriage bolts and 2 locknuts on each side to attach the mounting brackets to your RV's frame. Outriggers (LC301704 - sold separately) may be needed for installation depending on the model of your original stairs. 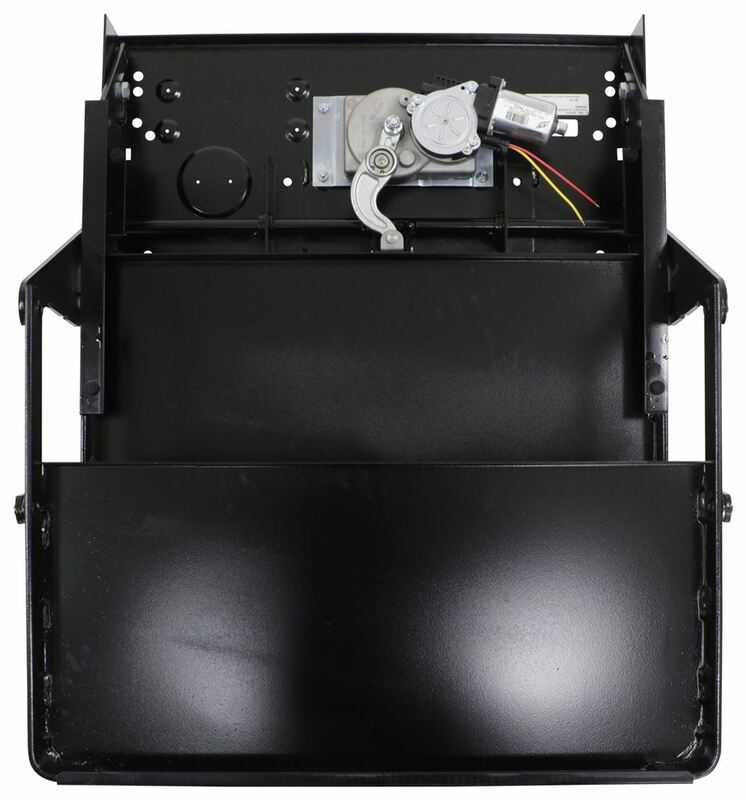 Powering the steps is simple because the included 4-way harness lets you connect to your RV and then plug right into the steps. This 8-3/4" deep x 24" wide, pull-out step is lightweight aluminum so that you can extend and retract it with minimal effort. Sturdy frame and linkages are constructed of durable steel. Ridged surface provides sure footing. 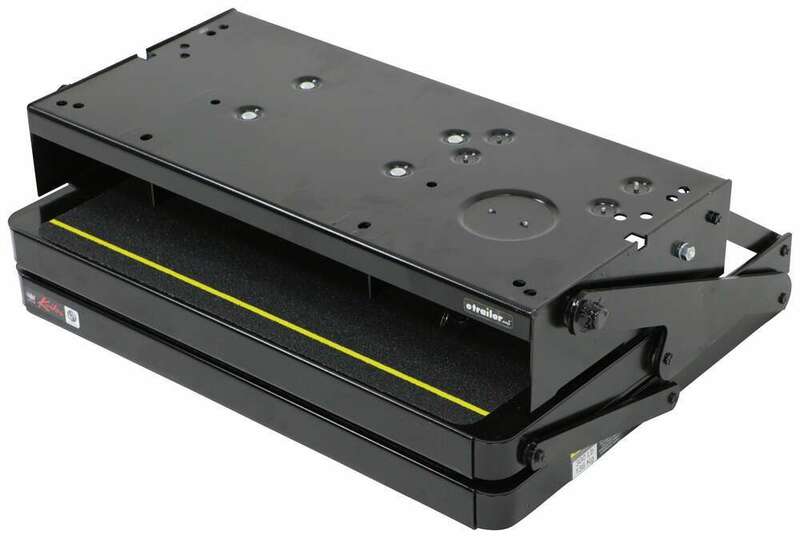 This 10-3/4" deep motorized step automatically extends and retracts when you open and close your RV door. Non-skid stepping surface ensures solid footing. Includes motor and switch kit. 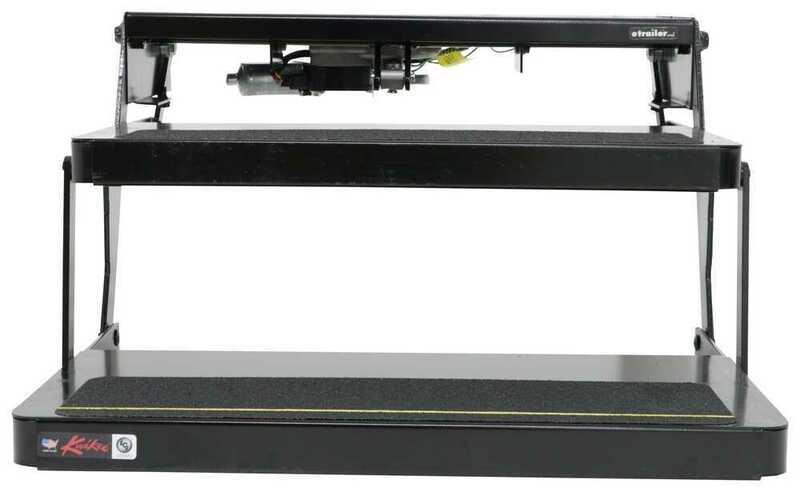 This 10-3/4" deep motorized step automatically extends and retracts when you open and close your RV door. A built-in LED light helps you see in the dark. Non-skid stepping surface ensures solid footing. Includes motor and control unit. Order: RelevanceNewestRating - High to LowRating - Low to High This 10-3/4" deep motorized step automatically extends and retracts when you open and close your RV door. Non-skid stepping surface ensures solid footing. Includes motor. Do you have a question about this RV and Camper Step? Yes, the Lippert Components Kwikee 32 Series Double Electric Step # LC3722616 that you referenced does include the motor and controller. Basically it comes with everything needed for the steps to power in and out once you wire them to your RV. 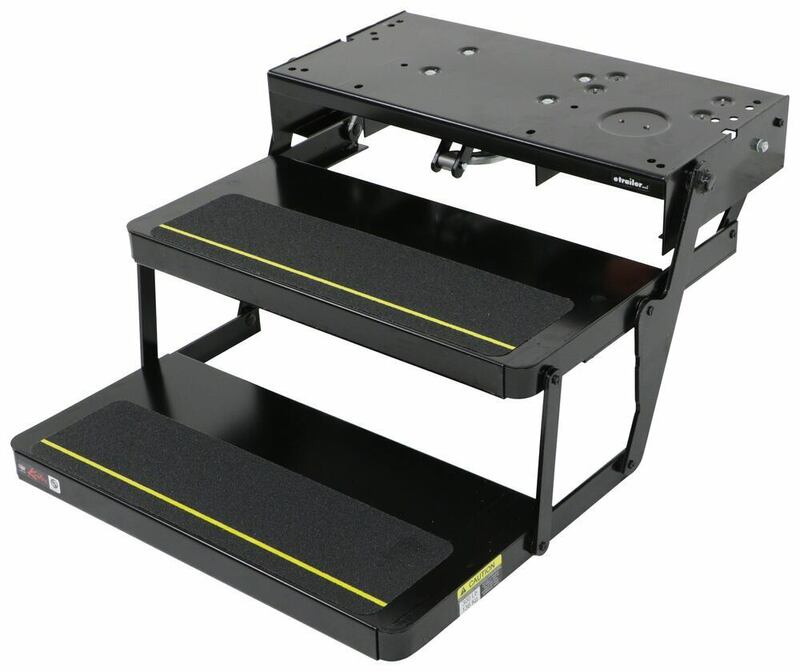 The replacement steps you will want for your 24 inch wide electric steps with 22 x 8 inch mounting are the Lippert Components Kwikee 32 Series Double Electric Step # LC3722616. These steps will be 24 inches by 9 inches and have a rise of 7 inches. 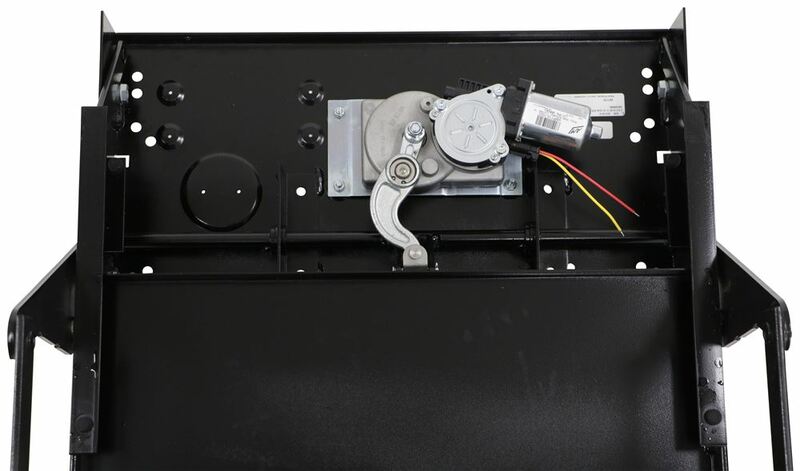 This step will also come with the switch kit to allow automatic extension and retraction when you open your RV door. Highest quality rv and camper steps for the best price. Most detailed, accurate rv and camper step information available.